If you haven't found this wonderful writer yet, check out the work of Mr. Terry Pratchett. I recommend starting with the Witch Books in his world famous Discworld series. Lots of people write books about what they think witches do. Terry Pratchett knows what witches are. Best of all, he know what witches are for. "Certainly witchcraft for Tiffany has very little to do with magic as people generally understand it. It has an awful lot to do with taking responsibility for yourself and taking responsibility also for the less able people and, up to a certain point, guarding your society. This is based on how witchcraft really was, I suspect. The witch was the village herbalist, the midwife, the person who knew things. She would sit up with the dying, lay out the corpses, deliver the newborn. Witches tended to be needed when human beings were meeting the dangerous edges of their lives, the places where there is no map. They don't mess around with tinkly spells; they get their hands dirty." [Click here to read an excerpt from Wintersmith. And Mrs. Earwig, said Mistress Weatherwax, her voice sinking to a growl, ' Mrs. Earwig tells her girls it's about cosmic balances and stars and circles and colours and wands and...and toys, nothing but toys!' She sniffed. 'Oh, I daresay they're all very well as decoration, somethin' nice to look at while you're workin', something for show, but the start and finish, the start and finish, is helpin' people when life is on the edge. Even people you don't like. Stars is easy, people is hard. Don't you wish you'd gotten that advice when you were new? Pratchett's books are, in many ways, wise. They are also beautifully written. His use of language is choice, at times even lyrical. He avoids sentiment, but honors feelings, especially when it comes to matters like ties to family and friends, or to the land. One powerful and recurring theme in his books is the struggle for (and within) his characters when it comes time for someone to stand against cruelty, stupidity, and the abuse of power, even when they know that all the odds are stacked against them. His vast cultural references are subtle, or not, depending on the story. Hunting and gathering these has been his many fan's joy for years, and they show that his own reading in history, myth, science, and fiction of all sorts is both deep and wide. But let us not forget that, while while Mr. Pratchett may indeed be guilty of literature, he is also a radically funny guy. "The three rules of the Librarians of Time and Space are: 1) Silence; 2) Books must be returned no later than the date last shown; and 3) Do not interfere with the nature of causality." - Guards! Guards! Nanny Ogg, her face red as her apples, seemed to give this some lengthy consideration. People who have no sense of humor generally have no sense of perspective or gratitude, either, and this can be a problem because these three gifts are the key to any useful spiritual practice. If the Pagans I meet can't laugh, especially at themselves, then I don't want to play with them. If they don't care about something other than themselves, I won't work with them. If they can't bear responsibility for their choices and their actions, as the witches in these books do, then I don't even want to know them. 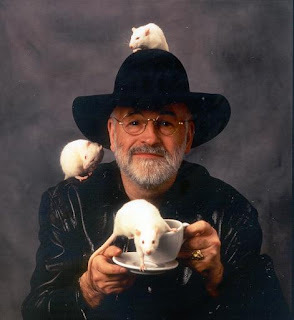 Pratchett's stories make us laugh and they ask us to think and they help us feel a bit more deeply, all of which makes him one of the best Pagan teachers around. These books feature characters in the form of the Maiden, the Mother and....the Other One; she being Mistress Weatherwax, constant winner of the annual Witch Trials, and leader of the Discworld Witches, a group notorious for having no leaders. Chronologically speaking, Equal Rites is the first book in the Witch series, but I suggest reading Wyrd Sisters, first. Equal Rites introduces an early version of Granny Weatherwax, and takes us into Unseen University, a wizard's college that is much older, very different (and, for my money, far more likely) than any you've read about before. These titles are a part of Discworld series written for young adults, but don't let a little thing like that stand in your way. There is more real wisdom in these 3 books than in 30 of the well known Pagan "How To" books I could name. Interesting Times (which features Rincewind, a favorite character of many DW fans. Rincewind is a Wizzard (it says so on his hat) with no real magical talent, who thinks too clearly for his own good, and has the oddest luck in the world). I also recommend Good Omens, a book he co-wrote with Neil Gaiman. Plans for a film version are currently in the works. Long time Pratchett fans will enjoy the L-Space Web. As this fan site notes, Terry Pratchett's work contains many references, allusions, parodies and in-jokes. Readers from all over the world have collected more than 2,000 annotations to such references in a huge document located at L-Space called the Annotated Pratchett File. (1) Interview with Joe Schaumburger (Editor) given to Wossname: Newsletter of the Klatchian Foreign Legion, September 2006 (Volumn 9, Issue 9). To read the full text please visit their website. (2) When it comes to it, I don't want followers. I prefer to work with colleagues and friends. Where they are on their spiritual path doesn't matter to me. What path they are on, as long as it's positive, doesn't matter, either. How they walk that path does matter. It matters very much. The photo above is one taken of Himself at the publication of his award winning children's book, Maurice and His Educated Rodents. "Just because you know how its down doesn't mean its not magic." Hi, I found your site through The Wild Hunt's Pagan Carnival. I really enjoyed this post on Pratchett's Witches. I agree that Granny Weatherwax has more useful wisdom than a store full of Llywellyn books. I just picked up Wintersmith and I can't wait to start reading it. I love Terry Pratchett, too. I copy "Pagan" passages from non-officially-Pagan books into my BOS all the time. Many passages from Pratchett have made their way into my BOS. Oh, Terry Pratchett is my all time favorite writer. I just finished "Hat Full of Sky" a couple days ago. Most excellent! "Hat Full Of Sky" should be required reading for anyone before they get involved in the Craft. There are some English witches out there who swear up and down that he's got spies in their covens. Do you think Mr. Pratchett would be pleased or horrified at his influence on modern Paganism? I've talked to him about this at some length, and, while not presuming to speak for him, I would say that he finds a certain wry amusement in this fact. While he is not Pagan himself, he knows very well that he has a large legion of Pagan fans and is very comfortable with us, seeing us as people first, and Pagans second. My impression of the man is that he supports anything that helps make people kinder, wiser, and more thoughtful than they usually are. As he says in Hat Full of Sky, "Witches deal with things". He seems to like people - all sorts - who do the hard work of dealing with the important things i.e. caring for those who need it and protecting those who need protection like children and animals. The silliness and posturing he sees in the Pagan community he clearly takes with a grain of salt. Again, I'm not speaking for him, this is merely my impression, based on our talks and on interviews he has given over the years. He knows it's a common human failing and not unique to us. Very good essay. Just one minor point: Mort is the first book in the Death series. Reaper Man is the second one. A well written piece indeed. As a Germanic Culturist I am very much enamoured with Terry and his works. Having some knowledge of ancestral magical practices, I find "A Hat Full of Sky" to be the best 'beginners' book for anyone whom is looking at Magic as something that may interest them. I strongly agree, if they fail to get it, then they simply are better off left to others. Sad thing is that they'll be taught by others whom fail to get it... but then that's humanity really, and why Pratchett is such a great study of human society and nature.